Ornamenting the eastern facade of the Sunrise House, slotted windows set in one-foot thick walls introduce light into the home without inviting in excessive amounts of heat. Glass windows wall in the open-concept kitchen-dining spaces of the Sunrise House while glass doors open the spaces out into the garden beyond. Designed to harness the sun, architect Birgitte Hovmøller's vacation house near San Diego features a roof full of solar panels and plenty of space for an extended family to relax. Finished in a dark wood, the kitchen features white metal countertops and shelving. A white pendant light, white sheer curtain and a white wall tie the interior design scheme in with the home's exterior palette. On the sunset side of the Sunrise house, the home's west terrace is shaded by mango trees. Shielding the bedroom from the courtyard, a black curtain affords privacy while the slotted window above the bed ensures that even when privacy is wanted, the room is bathed in light. An outdoor sink ties indoor living spaces into outdoor living spaces, adding to the fluidity and openness of the home. Windows shielded by the white overhand of the roof offer an elegant facade while shielding residents from the glare of the sun's sharpest rays. 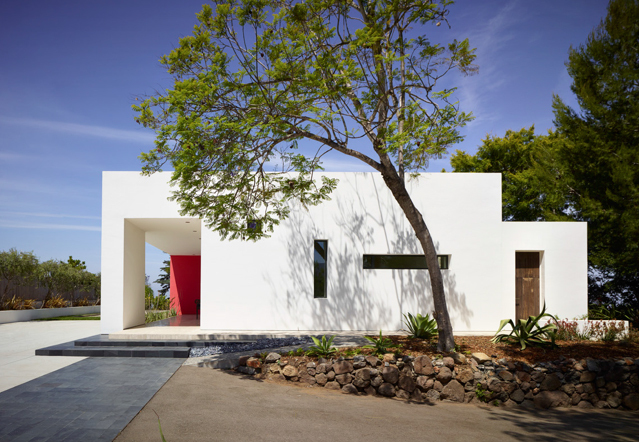 The Sunrise House, an architect's retreat just north of San Diego, in Vista, California, is bright and solar-powered. With its wide glass windows, a solar-powered water heater and a roof featuring solar panels and a solar electric system, the home uses California's most celebrated element to power all of its modern conveniences. As one of the two principals of the San Francisco-based Giraph Design firm, Hovmøller specializes in residential work, both on the California coastline and in her home country of Denmark. She built this particular project for her family's use, with her own family and members of her extended family using the home as a temporary vacation residence according to their differing schedules. With a sister in-law living close-by, Hovmøller says, "The daytime activities takes place at my sister in-laws place, and the Sunrise House is the retreat." The 1,800 square foot, two bedroom home also features a 500 square foot workshop on the same property, offering more beds and additional space so all the family is welcome. Such passive solutions reflect the principles of the styles that inspired Hovmøller: Scandinavian and Mexican contemporary and traditional design, which all feature clean lines, and rustic and minimalist elements. Visible from the home's west terrace, the lemon and mango trees fringe the property, reclining over the Sunrise house: the fruit of Hovmøller's labors.